If it appears that so much of what we study is religious in nature, it is usually because that is all that remains, in significant form, from a particular time or place. Non-ecclesiastical structures were not immune from attack because there was nothing sacred about them, though from our account of Reims above, as time went on nothing was immune from attack: witness orders by Adolph Hitler to burn all of Paris. But for the most part, throughout history, religious structures, when not specifically targeted for attack, went untouched. Except, of course, for destruction during the French revolution! Also, many secular structures – fortresses, bridges, capital buildings, indeed, entire fortified towns such as Carcassonne – were built for or were converted to military purposes, and so became targets during times of war. Avignon is located 600 kilometers (373 miles) south, southeast of Paris, and 100 km (62 miles) northwest of Marseilles. 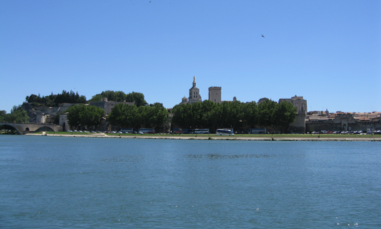 The city sits on the banks of the Rhone River. The fortified city lies at the foot of a 58 meter (190') high cliff, on top of which a Papal Palace was erected to house the Popes of Rome during their “Babylonian Exile” from 1309 to 1376. Later, during the Schism, the antipopes resided here until 1403. The city walls contain eight gates and thirty-nine towers. 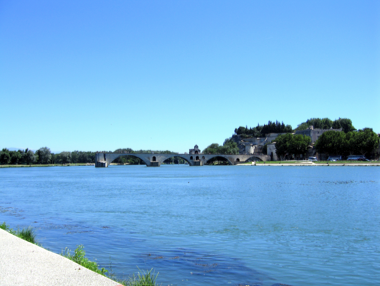 Avignon, with the bridge to the left, beginning its span onto the Rhone. This bridge, though partially destroyed and unusable as far as crossing the Rhone is concerned, has gone down in history as an example of Gothic secular architecture. It dates from 1177 to 1185, and stood intact until 1668, although local tour guides claim it was never completed in the first place. 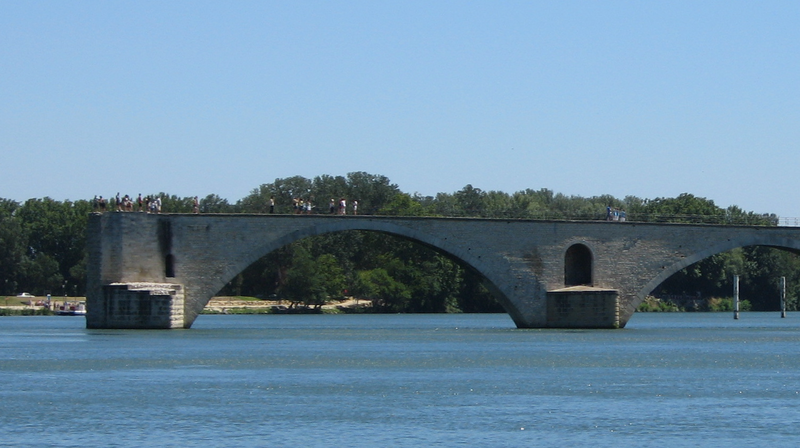 It crosses the river to Villeneuve-lès-Avignon. As was common with a lot of bridges throughout Europe during the Middle Ages, the Frères Pontifes, the guild of bridge-builders, placed a chapel on the bridge. It is told that the chapel idea came as a result – not just here, but throughout Europe – of the bridge workers giving thanks for still being alive after completing construction of a bridge. One has to realize the dangerousness of bridge building at any time in history, and especially when construction equipment was not as sophisticated as it is today. All in round there is danced. Interestingly, in researching the bridge, just about every other reference is to that of the song! Four arches remain. Their stone spans are quite graceful. Legend has it that it was built by a shepherd named Benezet, and had to be reconstructed several times, primarily in 1226. There is more on this legend below. The bridge uses a minimum amount of stone, and has pointed bulwarks, which naturally divide the current around the supports, and protect its piers. Local tradition tells that in 1199 (date discrepancy with some official texts, but one never knows exact truth in these instances) the young man, shepherd of Vivarais, heard voices, which ordered him to build a bridge on the Rhone. An angel led him to the place where it was to be constructed. The young man was treated as though insane by both the civil and religious authorities. He did, however, manage to convince the people of his mission, while working, seemingly without effort, with enormous stones. Volunteers then joined him and together created and trained what was to become the workers guild of the "Brothers Pontiffs.” They were charged to collect alms, which were received and, in eleven years, the bridge was built. The bridge measured, at the time, 920 meters (3,018'), and was composed of 22 arches. It connected Avignon to Villeneuve-lès-Avignon. 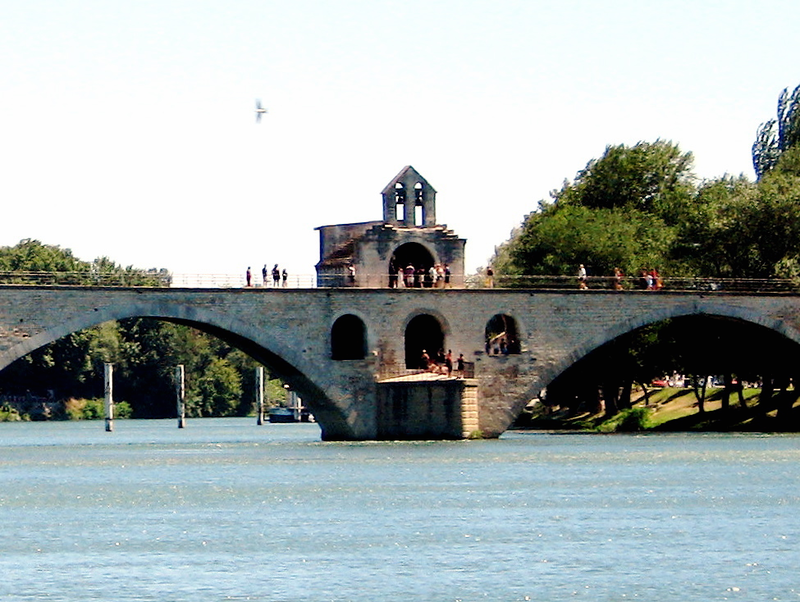 In 1226, Louis VIII destroyed three quarters of the bridge at the time of the siege of Avignon. It was rebuilt, then one arch fell, then another arch broke down, then three others in 1605. Work was started again in 1628, but was stopped by an outbreak of the plague. The bridge was usable again, however, in 1633. Disaster struck again, just two months later, when two new arches were carried away by the Rhone. At that time, various other means were then used to cross the river. 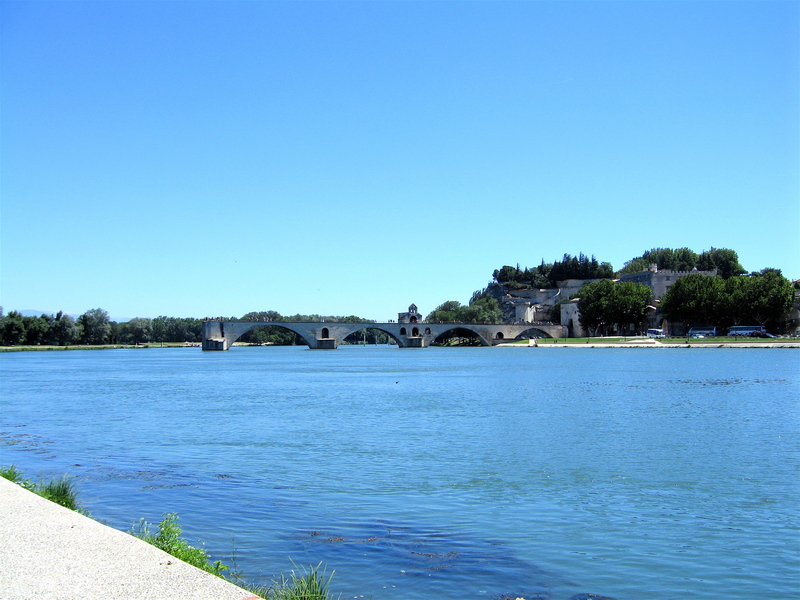 In 1995 UNESCO, as part of the Historic Centre of Avignon, officially classified the Bridge St. Benezet in the World Heritage List.